The 635-mile race across the Gulf Stream had 164 starters on June 20 at Newport, RI, in five divisions. The race has no single winner (only division winners), although the winning St. David’s Lighthouse Division boat is generally regarded as the race’s top boat. The fleet was started in 15 classes, each with its own prizes. Ten boats retired from the race due to damage or to tight schedules brought about by slow going in erratic winds. The conditions made for challenging racing that favored both smaller boats and crews who accurately analyzed the complicated conditions and kept their boats sailing as fast as possible toward Bermuda. Boats were often tightly clumped, with reports of 30 or more boats nearby or within sight. Actaea sailed in Class 1, for the smallest boats in the division, as did the second and third-place boat (each a Cal 40) – Flyer (Douglas R. Abbott, St. Michaels, MD) and Sinn Fein (Peter Rebovich, Sr., Metuchen, NJ). After five days of racing, the margin between the three boats on corrected time was just 45 minutes. This is Sinn Fein’s seventh trophy-winning performance in as many Newport Bermuda Races since 2002, including victories in the St. David’s Lighthouse Division in 2006 and 2008. The fact that she was even sailing was a triumph. After being nearly destroyed in Hurricane Sandy in 2012, she was rebuilt by her crew. Two St. David’s entries were given redress for their efforts to assist a competitor in trouble, Wandrian, a Canadian entry that suffered damage threatening the integrity of her hull. Dorade, skippered by Matt Brooks (Fremont, CA), was allowed 150 minutes for the time she spent standing by the boat. Black Watch, skippered by John Melvin (Greenwich, CT), escorted Wandrian to Bermuda under sail and power over a distance of 300 miles, and was subsequently assigned by the International Jury to a tie for fifth place in Class 7, and the race organizers presented her crew a special Seamanship Award in recognition of her extended attention to her competitor. Dorade and Black Watch are classic wooden yawls designed by Sparkman & Stephens in the 1930s and recently restored to their original condition. Racing Rule (ORR). In second place is Bella Mente (Hap Fauth, Minneapolis, MN), which crossed the finish line only seven minutes behind Shockwave. Third was Caol Ila (Alex Schaerer, Muensingen, Switzerland). The U.S. Naval Academy midshipmen headed by Joshua Forgacs in Constellation, a TP52, beat several larger boats to the finish and were fourth in Gibbs Hill on corrected time. Another USNA boat, the Navy 44 Swift, skippered by Nick Tucker, finished first in Class 2 and fourth in the St. David’s Division. The Cruiser Division is for boats that normally cruise, not race, and are sailed by amateur crews. It had 34 entries and was dominated by smaller boats. 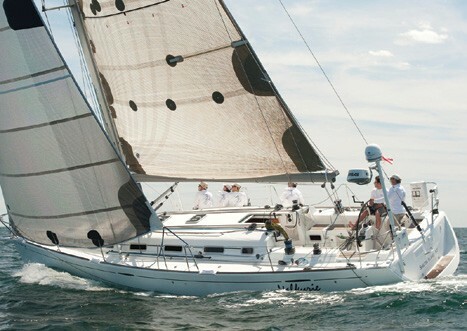 The winner is Attitude, a Beneteau 423 owned by Shawn Dahlen (Duxbury, MA). Like many boats in the race, Attitude got off to a fast start, averaging 7.8 knots over the first two days. Also, like most boats, the rest of her race was a story of calms. 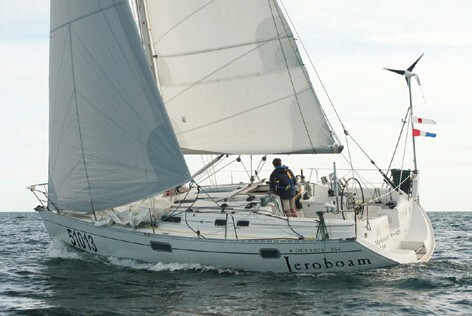 It took her many hours to sail the last 35 miles to the finish off St. David’s Head. 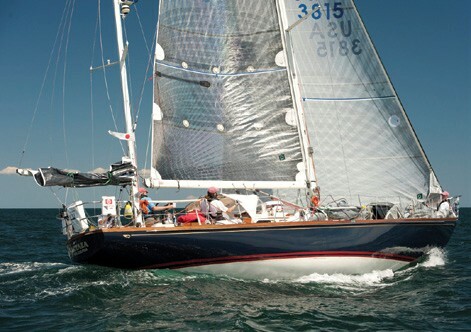 Runner-up was William F. Riley’s Pearson 39 Simpatico (Chatham, MA), followed by Matthew G. Pilon’s Hallberg Rassy 43 Liberty Call (Houston, TX). The Double-Handed Division for boats sailed by two sailors had 21 entries, and again the top boats were small. The winner of the Philip S. Weld Prize as corrected time leader is Jeroboam, Jonathan Green’s Beneteau 351 (Wakefield, RI; co-skippered by Russ Hancock). Her greater than six-hour victory margin was by far the largest in the fleet this year. In the 2012 race, Green sailed the Double-Hander Seabiscuit alone 200 miles to Bermuda after his teammate was evacuated by a cruise ship. Gardner Grant’s J/120 Alibi (Westport, CT), co-skippered by Stephen Fisk, corrected out to first place in the Double-Handed Division’s Class 14, which included four Class40s. H.L. DeVore’s Honahlee (Larchmont, NY) was victorious in the 7-boat J/44 class. 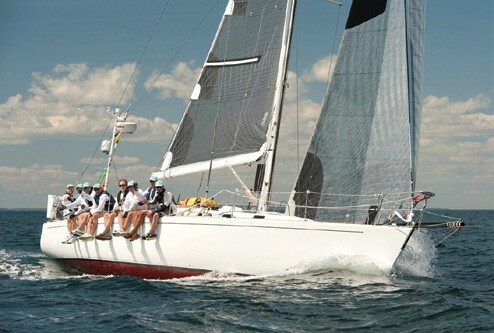 Drew Chapman’s Beneteau 44.7 Valkyrie (Shelter Island, NY) won Class 4.